You'll love these old fashioned homemade waffle recipes. 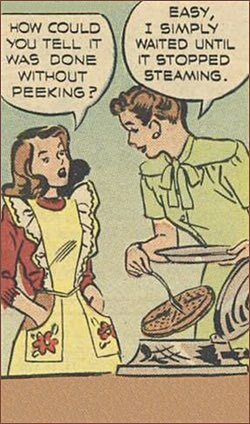 I can remember when Mom got her first waffle iron. 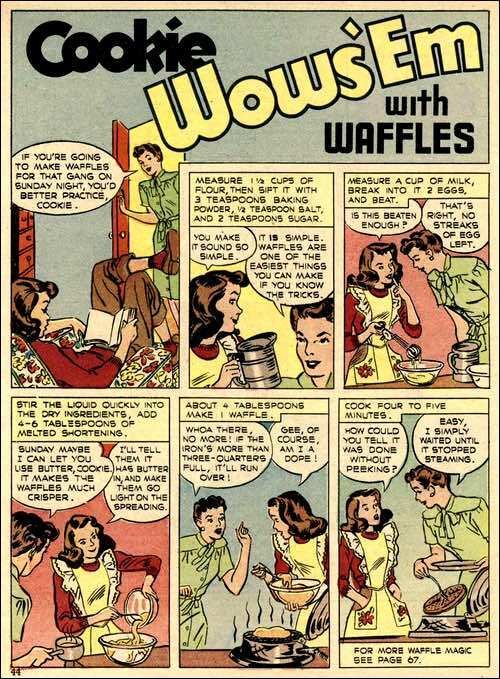 We had golden crisp waffles for breakfast, dinner, and supper that day as she experimented with recipes and ways to serve them. That's the great thing about waffles, they're so versatile. You can enjoy them at any time of the day. And as shown below, they're so easy to make too. 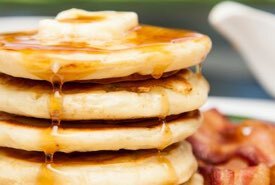 Waffles make a wonderful breakfast treat, Sunday night supper, or even dessert, and this basic recipe for waffles, which will turn out five or six waffles, is just as simple as it sounds. But that's not all. Like a good suit, you can dress it up or dress it down. 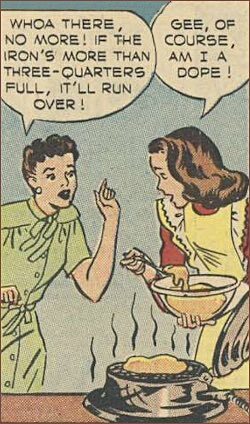 First, though, let's go into a couple of baking tricks. If you want your waffle even and flat, make sure the iron is level. 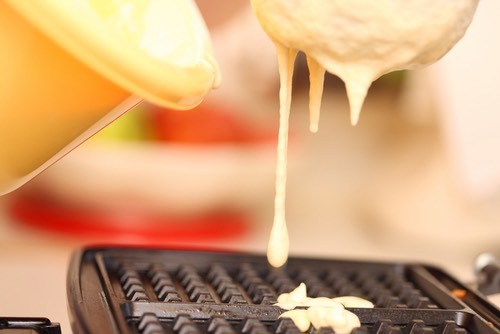 Always preheat the iron for each waffle, pour the batter in quickly, and close the iron as fast as possible. If your iron has no heat indicator, test it by putting in a teaspoon of water. When it stops steaming, the iron is ready for the batter. To cure sticking, turn the iron off for a minute, leave it shut and open it gently when you think the waffle should have softened a little. Presently, it will come free. Measure 1-1/2 cups of flour, then sift it with 3 teaspoons baking powder, 1/2 teaspoon salt, and 2 teaspoons sugar. Measure a cup of milk, break into it 2 eggs, and beat. Stir the liquid quickly into the dry ingredients, add 4 to 6 tablespoons of melted shortening (or butter, as butter makes the waffles much crisper). About 4 tablespoons of batter make one waffle. Cook for four to 5 minutes, until waffle stops steaming. Now let's get back to the batter. It's a marvelously adaptable gloop. There are a number of ways you can dress it up for luncheon parties. For instance, add a cup of grated cheese to the batter after the shortening. This glorified waffle, served with a couple of strips of bacon and a broiled tomato, is really something. Or sprinkle a couple of tablespoons of minced ham over each waffle just before you close the iron. You'll love 'em! Try a cup of grated coconut, stirred into the batter, or sprinkled on, and top it with chocolate sauce. Sir in three-quarters of a cup of broken pecan meats and serve sprinkled with cinnamon and brown sugar or good maple syrup. Three-quarters of a cup of stewed apricots or prunes chopped fine and served with the juice will prove pleasant. And a cup of sliced bananas in the batter with a final topping of vanilla-flavored whipped cream — just supposing you can assemble the makings — is sure to produce cries of joy. Sift together the flour, baking powder, salt, and sugar. Crush the cornflakes into fine crumbs. Mix with the sifted dry ingredients. Beat egg whites until stiff but not dry. Beat egg yolks until thick; add milk, dry ingredients, and cooled melted shortening, stirring only until combined. Fold in stiffly beaten egg whites. Bake in hot waffle iron until brown and crisp. Makes 7 servings. 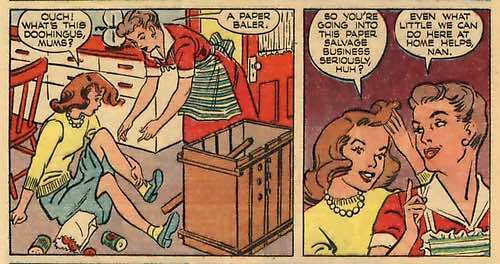 Recycling is quite common today, but during World War II the governments of Canada and the USA encouraged citizens to salvage scrap metals, rubber products, and waste paper to support the Allied war effort. Mix the milk and butter together, and add enough sifted flour to make a soft waffle mixture. Add the well-beaten yolks, then the beaten whites. Lastly, before baking, add 8 teaspoons baking powder. Pour into waffle iron. This recipe is also quite good with just 4 or 5 eggs, but it's best as above with 6. Sir the cornstarch and flour together until mixture is smooth, and add salt. Gradually mix in the sour milk, beaten egg, and the level teaspoon of soda dissolved in a little water. Pour mixture into hot waffle iron. Rub through a sieve one pint of boiled white rice, add it to a tablespoonful of dry flour, two-thirds of a teaspoonful of salt, two teaspoonfuls of baking powder. Beat separately the yolks and whites of three eggs; add to the yolks a cup and a half of milk, work it into the flour, then add an ounce of melted butter; beat the whites of eggs thoroughly; mix the whole together. 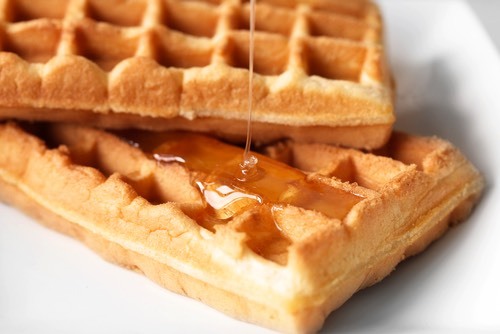 Heat the waffle iron and grease it evenly; pour the batter into the half of the iron until nearly two-thirds full, cover, allow to cook a moment, then turn and brown lightly on the other side. One pint of sour cream, two eggs, one pint of flour, one tablespoonful of cornmeal, one teaspoonful of baking soda, half a teaspoonful of salt. Beat the eggs separately, mix the cream with the beaten yolks, stir in the flour, cornmeal, and salt; add the soda dissolved in a little milk, and, lastly, the whites beaten to a stiff froth. This homemade waffle recipe is thought to have its origins at the Hotel Continental in Washington, DC. 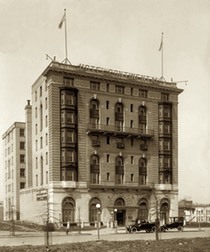 The 250 room hotel was built circa 1910 and faced the Capitol Plaza. It was demolished sometime in the 1970s. 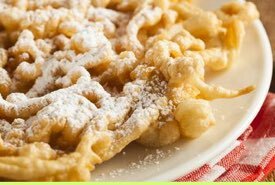 Put into one quart of sifted flour three teaspoonfuls of baking powder, one teaspoonful of salt, one of sugar, all thoroughly stirred and sifted together; add a tablespoonful of melted butter, six well-beaten eggs, and a pint of sweet milk; cook in waffle iron heated and well greased. Serve hot.